Many of us suffer from some back issues. 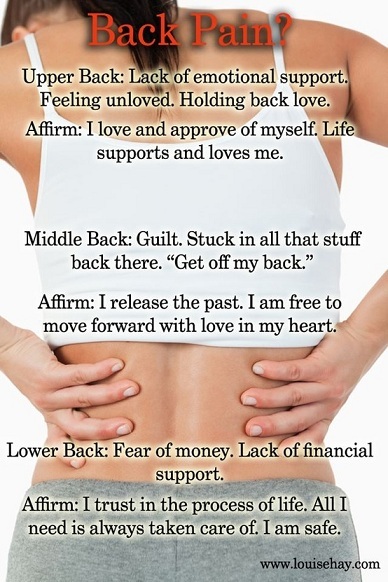 Today I want to share the following healing affirmations for the back from Louise L. Hay’s book, Heal Your Body. When you are choosing to use one or all of these affirmations, find a quiet time, relax, and most of all give your full attention to the area of the back where you want to use the healing affirmation. Repeat as often as needed each affirmation with love and compassion. I like to end my back affirmations rolling my shoulders several times first backwards and then forwards to help release more tension. LETS TAKE CARE OF OUR BACK!